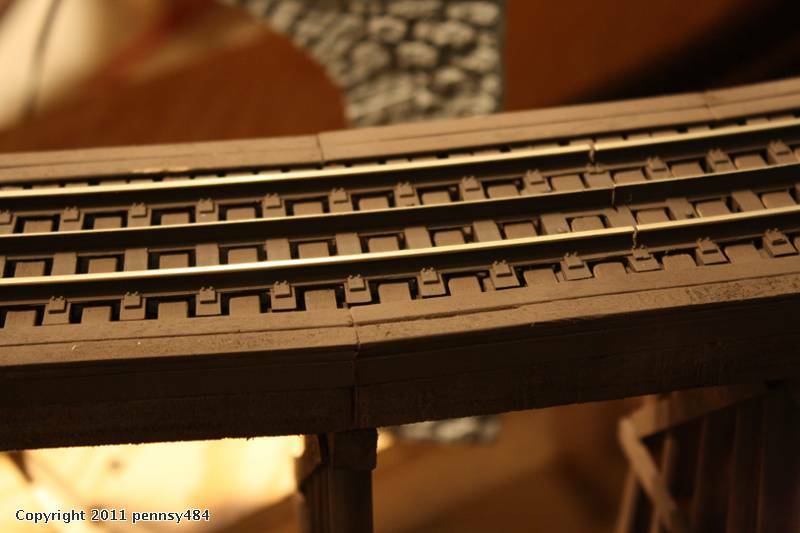 Photo 1 (below): This shows part of the original track plan. Note the lack of significant benchwork in anticipation of a bridge to come later for this track. Photo 2 (below): But there was a change of plans. 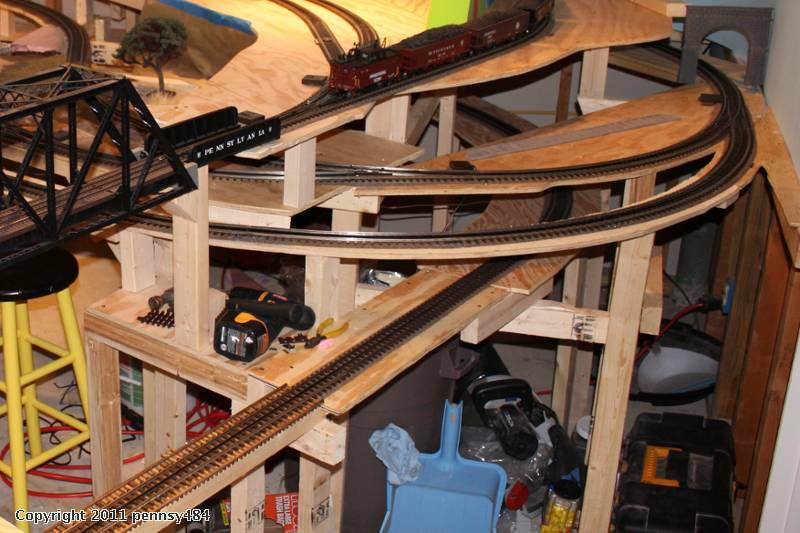 I added a lower level and a grade track to get to it. The idea of the bridge was moved to this new outer curve. Again I kept the benchwork minimal to keep options open for the bridge. Photo 3 (below): Originally, I guess my thought was to remove the plywood and build a "real" bridge. 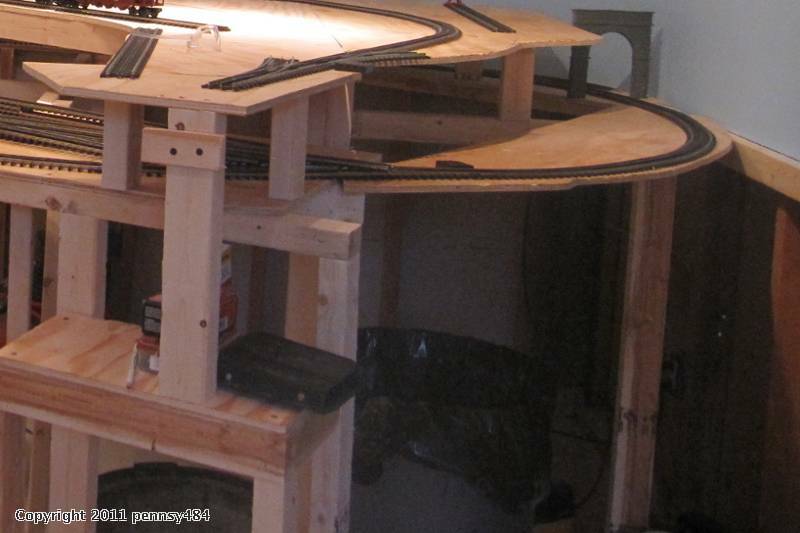 However, since this is on a curved grade, I really shuttered at the thought of removing the plywood I had already done. So I kept it and built around it. 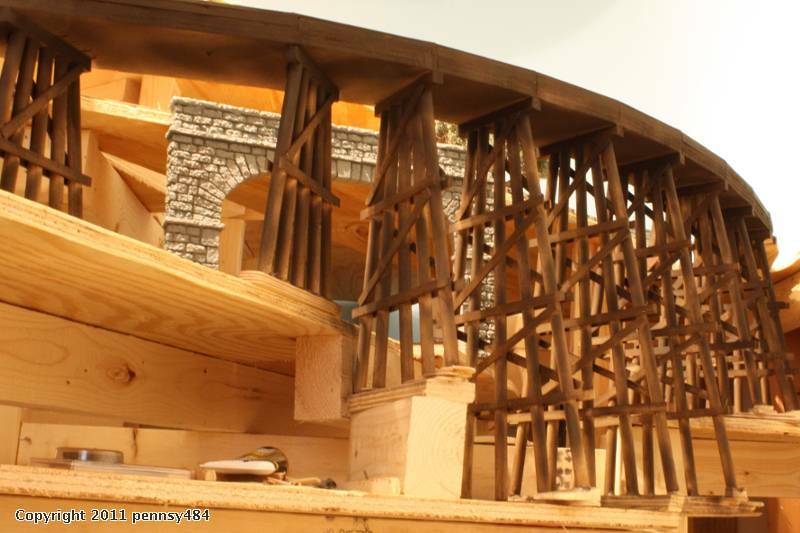 Photo 4 (below): Leaving the track and cork secured, I cut the plywood to the size and shape I wanted, so as to simulate relatively straight beams spanning from one tressel to the other. I painted the cork black. I used "Woodsies" from Michaels, slipped between the ties and between the track and cork, to simulate ties spanning the width of the bridge. To try to hide the thinness of the woodsies, and create a bit of an illusion that they are as thick as ties, I built up the ends with cut pieces of paint stirrers (the big 2 foot long ones, free from Home Depot) and more Woodsies, which look like a walkway (though 1:48 me wouldn't walk there, yikes!). The paint is Krylon Camoflauge Brown. Detailing and weathering will improve the look later. Photo 5 (below): The bents are prefabricated pieces from my LHS. Note the flatness of the bottom of the plywood underneath. I would like to cut or paint this to somehow simulate beams instead. 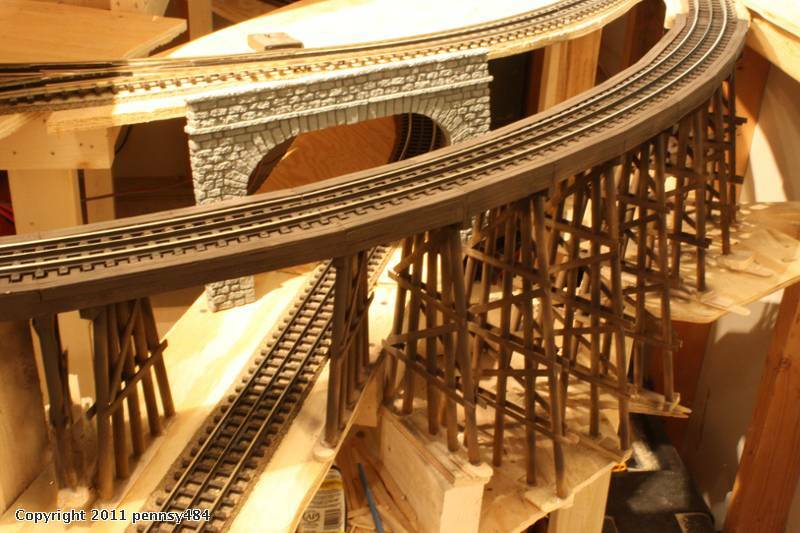 After the scenery is done in this area, I am going to add angeled supports for the portion where the track goes under the bridge, and will add cross braces between the bents. pennsy484 this looks terrific - any updates for us?